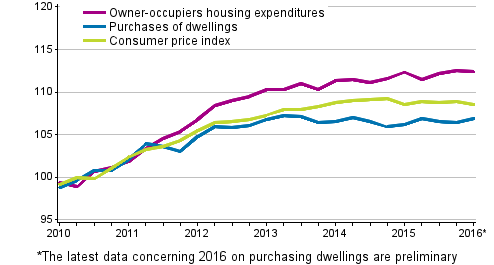 According to Statistics Finland, the housing costs of owner-occupied dwellings remained unchanged in the first quarter of 2016 from the respective quarter of the year before. According to preliminary data, the price of buying a dwelling went up by 0.6 per cent from the corresponding period. Compared with the previous quarter, the housing costs of owner-occupied dwellings fell by 0.1 per cent and purchasing of dwellings became 0.5 per cent more expensive. Statistics Finland's indices of owner-occupied housing prices consist of two index series. The first, housing costs of owner-occupied dwellings series describes the development of the costs of owner-occupied dwellings. The housing costs of owner-occupied dwellings consist of the prices of new dwellings purchased by households and other costs of owner-occupied dwellings, like renovations. The second, housing prices series describes the price development of all dwellings. The index is based on the data in the statistics on prices of units in housing companies and real estate prices. The calculation of the statistics is based on Commission Regulation (EC) 93/2013. ISSN=2341-6971. 1st quarter 2016. Helsinki: Statistics Finland [referred: 21.4.2019].